September is the month of the sapphire. Desirable due to its beautiful colour, durability and lustre, sapphires have long been associated with royalty and have been popular since the Middle Ages. 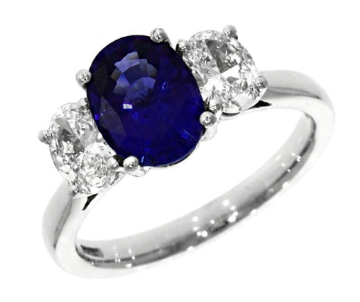 Today, most natural sapphires undergo a heat treatment process in order to improve their colour and clarity, which also helps to protect them against scratching. Untreated gems are rare and incredibly valuable. 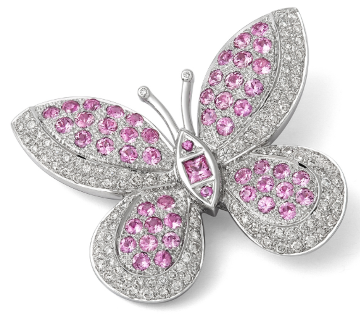 While sapphire usually refers to the rich blue variety of the mineral corundum, this stone can occur in many shades, from pale pink and colourless to orange and green; the exception is red, as that would earn this royal gem the classification of ruby. The colour of a sapphire typically determines its price, with the highest valued gems possessing a rich, vividly blue hue. The word ‘sapphire’ comes from several ancient languages. The Arabic safir, the Latin sapphirus (which means blue), and the Greek sappheiros, so called after the island of Sappherine in the Arabian Sea, where these gemstones were found in ancient times. Mystical powers have been attributed to this gemstone throughout history, and across different cultures. Ancient Persians called sapphires the ‘celestial stone’ while ancient Greeks used to believe these were the gems of Apollo, god of truth and prophecy. Etruscans used sapphires as far back as the 7th century BC. In Europe, the belief was that sapphires cured eye diseases and other maladies and were worn by medieval kings who thought these stones could protect them from enemies. The clergy also adorned their robes with sapphires during the Middle Ages, as they believed the gems symbolised heaven. For over 2000 years, Sri Lanka has been a source of fine sapphires, with the stones exhibiting a wonderful brilliance and saturation. The country is also one of the only ones to source the rarest of sapphires, a pinkish-orange gem called padparadscha (from the Sinhalese word for ‘lotus flower’). This sapphire is highly coveted and possesses a very high value per carat. Myanmar (Burma) is also a source for some of the world’s most prized sapphires, as many gems with the saturated violet-blue colour can be found here. Around 1881, a landslide in the Himalayas uncovered a large deposit of cornflower-blue sapphires, adding the Kashmir region to one of the most sought-after for sapphires. Colour – The most valued hue is the rich cornflower blue that is most commonly associated with this gem. Different colours are caused by impurities in the gem; yellow sapphires contain ferric iron, blue sapphires iron and titanium, and colourless sapphires have no contaminants, for example. Secondary hues of green or grey can diminish the value of a sapphire. There is also a rare variety of sapphire that exhibits different colours in different lights; this colour-changing gemstone can show hues of blue in daylight and hues of red under incandescent light. Asterism – This is a star-like pattern on a cabochon-cut stone. It occurs when the sapphire is examined in direct sunlight or with intense light and results from needle-like inclusions of rutile or hematite. Clarity – Blue sapphires tend to have better clarity than rubies, but they also often possess long, thin inclusions called ‘silk’. These defects can sometimes devalue gemstones, although they can also increase the value of sapphires that exhibit asterism. Carat – Sapphires range in size and can have a varying degree of carats. A large majority of commercial-quality sapphires weigh less than five carats, with 2-carat sapphires being fairly common. Sapphires that weigh up to 10 carats can be found in a variety of colours. Hardness – Sapphires are one of the most durable naturally-occurring elements in the entire world. These gems score a 9.0 on the Mohs scale of hardness and can only be scratched by a diamond, making them fantastic stones for everyday jewellery, such as engagement rings. This hardness also makes the sapphire incredibly useful for watchmaking, with many luxury timepieces featuring a sapphire crystal case. Star of Adam – The world’s largest blue star sapphire; this oval-shaped gemstone weighs 1404.49 carats and exhibits asterism. It was found in Ratnapura (nicknamed ‘city of gems’), Sri Lanka in 2015, and its size is due to continuous but slow changes in temperature and pressure over millions of years. This gem was valued at over £232 million. Black Star of Queensland – Previously the largest gem-quality star sapphire ever found before the discovery of the Star of Adam, the Black Star of Queensland was found in Australia and weighs 733 carats. This black sapphire was discovered by Roy Spencer, a 12-year old boy, in the 1930s. Logan Sapphire – This 422.99-carat gem is one of the largest faceted gem-quality blue sapphires in the world. It’s a flawless cushion-cut sapphire with a rich blue colour that has been set in a brooch surrounded by 20 round brilliant-cut diamonds (which weigh, in total, 16 carats). This beautiful gem can be found in the National Museum of Natural History in Washington, DC. Hall Sapphire and Diamond Necklace – This piece is on display alongside the Logan Sapphire and is a gorgeous necklace with 36 matched sapphires from Sri Lanka, totalling 195 carats and cut into several different shapes, from pear to round and cushion. These gems are surrounded by 435 brilliant-cut diamonds that total 83.75 carats. Bismarck Sapphire Necklace – Also on display in the National Museum of Natural History in Washington, DC, alongside the Logan Sapphire and the Hall Sapphire and Diamond Necklace, is the Bismarck Sapphire Necklace. It was designed by Cartier in 1935 and possesses a 98.56-carat table-cut sapphire mined in Myanmar. Edward’s Sapphire – This octagonal, rose-cut sapphire is part of the British Crown Jewels and is thought to have been in the coronation ring of Edward the Confessor in 1042. The sapphire was added to the Imperial State Crown by Queen Victoria and is now on display with the other Crown Jewels in the Tower of London. Lady Diana’s Sapphire – One of the world’s most famous royal sapphires, the engagement ring gifted to Lady Diana Spencer in 1981 features a stunning 12-carat oval blue Ceylon sapphire surrounded by 14 solitaire diamonds. It was designed by then crown jeweller Garrard & Co, and its estimated value in 2016 was of £308,000. The ring is now worn by Catherine, Duchess of Cambridge. The sapphire is amongst the most prized and cherished of gems, and not just by royals. On the contrary, sapphires are often the gem of choice when it comes to engagement rings – it’s also the commemoration stone for the 5th and the 45th wedding anniversaries, so sapphire jewellery is the perfect anniversary gift for your beloved. Luxury, elegance and beauty – the sapphire is a lovely gem that can complement any wardrobe, be it as a ring, necklace, bracelet or earrings. We have a vast range of birthstone jewellery at our Lancaster and Kendal stores that make wonderful gifts to be treasured forever.